Well, keywords help your online content to be found easily by your intended audience. However, they also have the tendency of attracting an unwanted or unintended audience, leading to you getting traffic that is worthless to you. That leaves you thinking you are getting traffic when a significant portion of that traffic was useless. To ensure or restrict the traffic you get to only quality traffic, negative keywords are vital. Negative keywords help you identify the keywords that will attract unwanted traffic so that you can focus on keywords that will get you good traffic. Here are a couple of ways for taking note of negative keywords for your business to help attain more conversions. 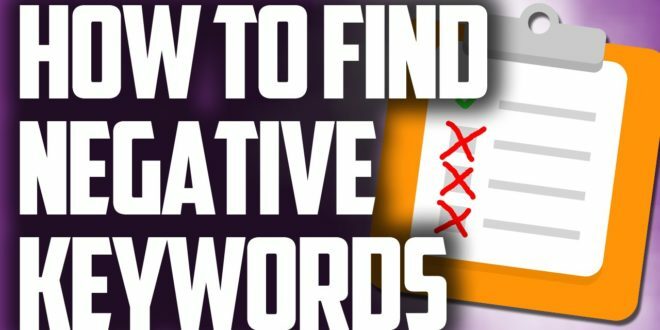 Negative keywords are a thing and various tools are available to help you identify them. Google Ads is one of the most reliable tools you can use for this task. It may be a bit time consuming but it is worth the effort. Going through your search terms report is one of the most reliable approaches for determining negative keywords. The secret is in monitoring your search terms on a regular basis. This will help you to notice the keywords that are attracting the wrong traffic so that you can avoid them. Once you have found a few keywords, it helps if you look for other similar or related keywords. The main goal for this SEO strategy is thoroughness. Better safe than sorry. Use the negative keyword finding tools and your search terms report among others to determine the initial negative keywords. However, don’t rely too much on the tools. Computers are good at doing complex tasks like going through a lot of data and pinpointing specific things but we still outperform them when it comes to reasoning. Combine some of that human brainpower with the computer processing power to find related or similar negative keywords and steer clear of them. Identifying negative keywords is a great method for ensuring that your ads are shown mostly or only to the right audience. However, if you are working with multiple campaigns, you should be careful not to prevent some of the ads from showing up to the right people. Some keywords may be negative for one ad campaign but crucial for another. When identifying negative keywords, ensure that they have nothing to do with any of your ad campaigns to prevent any conflicts. The common sense approach after identifying negative keywords is to note them down. Make a list of the negative keywords that your ads should not show up to and make life easier for yourself. However, remember that albeit they are negative keywords, they may be toxic to one campaign but an elixir for a future one. Consider negative keywords project or campaign specific. Once you have achieved your goals with the current campaign, it is only natural that the negative keywords may become irrelevant. Be flexible and adjust according to the wind.